Georgia may call itself the Peach State, but South Carolina actually leads its neighbor in peach production. In fact, despite our size, we beat every state in the nation except California. The delectable treat became the official state fruit of South Carolina in 1984 and has earned its place at the table, so to speak, producing more than 90,000 tons a year. How 'bout them apples ... er, peaches? 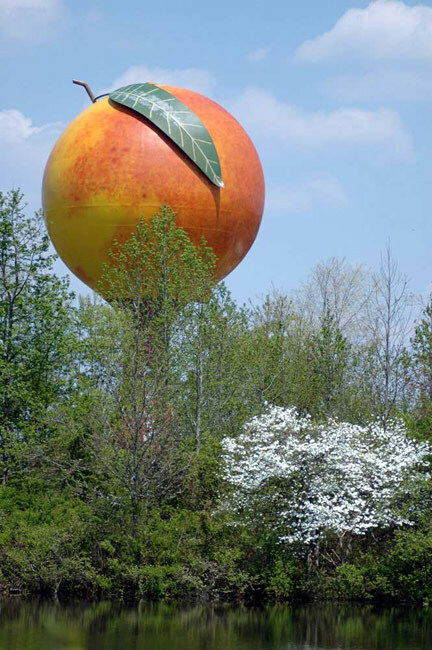 The Peachoid, Gaffney's famous roadside attraction pictured below, depicts South Carolina's sweetest bumper crop. The idea of the Peachoid came to Gaffney Board of Public Works member Jack Millwood when it was decided that an elevated water tower was needed for the area. His famous words – "Let's build it in the shape of a peach!" – are immortalized in the enormous depiction of the pitted fruit that looms over I-85. Built in 1981 over a period of five months, the iconic water tower features a cleft, a stem, and a seven-ton peach leaf. It holds one million gallons of water and can be seen between exits 90 and 92 of I-85. Made to highlight the region's prime natural product, the Peachoid's colors are meant to reflect the varieties of peaches grown in the area. After the basic colors were applied to the tower's various parts, artist Peter Freudenberg used 50 gallons of paint and more than 20 colors to achieve the desired effect. Learn more about South Carolina's state fruit – the peach! Attention parents! Summer break will be here before you know it. If you are looking for fun and educational places to send your kid(s) for camp, breathe easy – SCIWAY's 2014 SC Summer Camps Guide has arrived! Our directory will introduce you to the best sports camps, tech camps, art camps, and overnight camps in the state. Listings include camps sponsored by colleges, churches, theaters, and zoos. From Aiken to Winnsboro, we've got your camp options covered. By the way, want to know the most interesting summer camp? It might just be a dead tie between "Princess Camp" and service dog training. Who knew? There's a camp out there for everything! April 25 - May 4, 2014 | Lake City — This year's April Calendar of SC Events is brought to you by ArtFields, a unique Art Competition and Celebration to be held in the historic community of Lake City, South Carolina. This 10-day event features live music, dancing, delicious Southern foods, and cash prizes totaling $100,000 that will be awarded to winning artists, including the $50,000 Top Prize, the $25,000 Juried Panel prize, the $12,500 People's Choice 2-D, and the $12,500 People's Choice 3-D. In addition to SCIWAY's April Calendar of SC Events, remember that all of our event calendars, for every month of the year, are always available on our website – just go to https://www.sciway.net/calendar.html. You can sort events by date, city, name, or type – it is hands down the best South Carolina calendar anywhere!